EBay "shoppable storefronts" in NYC give window shopping new, more literal meaning. EBay’s new “shoppable storefronts” will let customers buy items on a touchscreen display on the front windows of vacant storefronts. 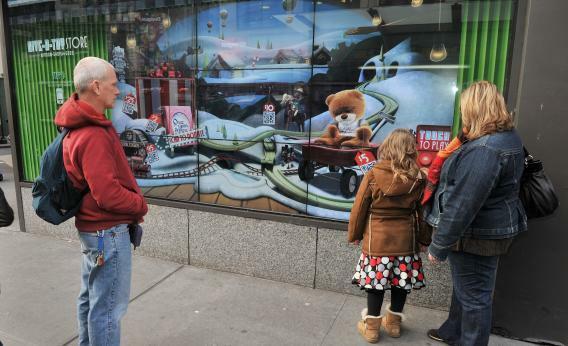 Pictured above is a 2011 eBay initiative called the “Give-a-Toy Store,” which let shoppers in New York City’s Herald Square donate to Toys for Tots from their mobile devices using QR codes. Reuters reports that eBay is launching a new kind of virtual store that it calls “shoppable windows.” Starting on June 8, the company will put nine-foot-wide touchscreens on the front windows of four shuttered New York City storefronts. The screens will display wares from Kate Spade Saturday, a new fashion line, and shoppers will be able to order items on the screen and have them delivered by courier within an hour. They’ll pay the courier using a PayPal Here credit-card reader. In the future, the technology might also be used by small retail outlets to let customers buy products that they can’t stock on the premises. For instance, the same company that is launching the Kate Spade Saturday brand tells Reuters it’s thinking about putting the shoppable windows on existing Kate Spade New York stores to sell things like linens and home furnishings. It’s tempting to evision shoppable windows as the Jetsons-like future of retail, with stores eventually doing away with physical shelves and on-site stock altogether in favor of glossy interactive facades. The window would be the whole store, while the space behind it could be converted to offices or some such. For now, though, shoppable windows are better viewed as a bridge between the virtual and physical retail realms, complementing each but replacing neither. On their own, the windows would amount to the worst of both worlds: You can’t try things on like you can in a real store, and you can’t comparison-shop between brands and websites like you can on the Web at home. TechCrunch’s Darrell Etherington compares the concept to the catalogue retail counters of the 1980s, which does not seem like much of an endorsement. If nothing else, though, eBay’s windows make a great solution to the problem of empty retail storefronts in high-traffic areas. Now, instead of being forbidding dead spots that hurt neighbors’ property values, vacant storefronts could offer the best window-shopping on the block. Or at least the most literal.